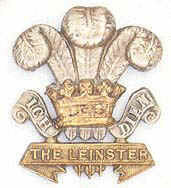 All goods purchased from the Leinster Regiment Association are shipped via Royal Mail as follows. Charges are based upon the combined weight and size of the goods shipped. The appropriate charge must be added to the price of the purchased goods. There is space for this on the order form.